The five elements can be useful in determining if the energy or chi in your home is balanced. 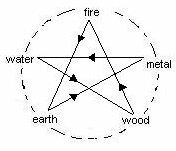 The 5 elements are: wood, water, earth, metal and fire. While everyone is complex and everyone’s personality likely includes a little of each one of these elements, everyone will have one (or sometimes two) elements that are more important to them. Using the following description, you can discover which of the five feng shui elements plays an important part in your personality. Wood. A wood personality is similar to a “Type A” personality. A wood personality likes to win and dominate others. Active, practical and demonstrative, this person has many friends and likes to coordinates events. Anger is sometimes a problem for wood personalities. In a home, quiet wood areas are good for contemplation and creative activities such as writing, music, painting, etc. Water. A person with a water personality is intelligent, honest and wise. Such a person has a great imagination and comes up with innovative solutions on a regular basis. This person is also independent and ambitious but can be overly secretive and fearful at times. In a home, water elements can enhance emotional aspects and as such, they should be used in moderation. Earth. You could describe an earth person like the perfect doctor. Compassionate, patient, sympathetic, honest and this person likes to help people and enjoys feeling needed. At times, an earth person worries a little too much and can be stubborn. In a home, earth elements will add comfort to a room. Metal. A person with a metal personality is very severe and organized. A metal personality likes to control people and apply strict quality standards. At times, this inflexibility combined with a strong desire to always be right may become a negative attribute. In your home, metal elements will help with the overall organization and can be useful in areas where analytical thinking is required. Fire. A fire person is brave, loving and courageous. This person is polite, courteous, communicates well with others, and needs excitement. Sometimes a little too impulsive, this person makes a lot of rash decisions. In your home, fire elements such as a fireplace, candles or other triangular elements will add warm to a room. Have you figured out which one of the five elements you are? What about your husband/wife, children? Any of the elements ring a bell? In order to fully relax at home, you need to make sure your family relationships are balanced. Like water extinguishes fire, a water personality can be destructive to a fire personality. The following order is destructive for the elements. Fortunately, the elements also affect each other in a positively. The following diagram illustrates the positive cycle. 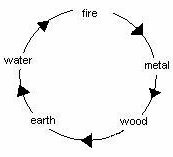 As you can see, wood helps fire elements, fire helps earth elements, earth helps metal elements, metal elements help water elements, and water helps wood elements. These interaction cycles between the five elements are important in each room layout as well as in the overall house and its location with respect to its immediate surroundings. 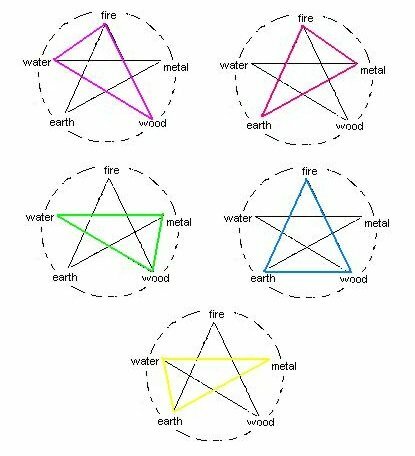 To find out which of the five elements are at play in a specific room, you need to consider the overall shape of each item and compare it with the shape of the elements shown above. For example, a rectangular desk would display the overall shape of earth. If this desk is made out of wood, then it is also affected by the wood element. You should always keep in mind that these five elements are good in moderation. Medical conditions can worsen if an unbalance is created. Find out how the five elements form an integral part of Feng Shui here.